What can I do to prepare my child for the transition to kindergarten? The transition to from 4K to 5K (kindergarten) is an exciting time for you and your child. Your excitement and confidence will help your child view school as a fun, positive place to be. Get connected with your child’s school -- be sure to register early! 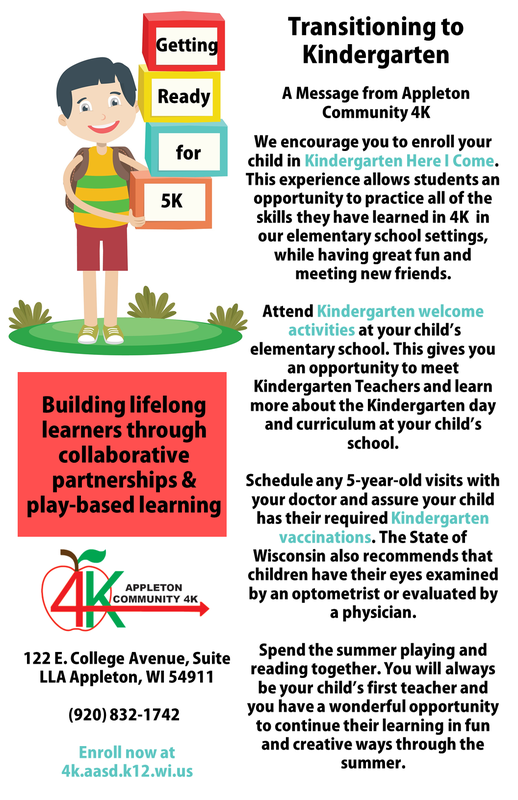 If your child is enrolled at an Appleton Community 4K site, most Kindergarten registration paperwork is already completed. Additional information about Kindergarten registration and orientation will be provided through your home school. If your child is eligible to attend kindergarten this fall and is not currently enrolled in Appleton Community 4K, please contact your neighborhood/home school office to register. If you are unsure which neighborhood/home school your child should attend, please call the Attendance Office at (920) 832-6116 or view our school boundaries. The AASD offers several activities for children entering kindergarten in the fall, as this is a time of transition for both children and their parents. Parents/guardians are encouraged to attend a 3-5 Year Old Developmental Screening with their child. In addition, most elementary schools offer a Kindergarten Open House for parent and child to learn about their neighborhood school and the transition to kindergarten. Appleton Community 4K can provide that information. Welcome visits are offered to families with incoming kindergarten students. Finally, the AASD offers "Kindergarten, Here I Come!" a summer school program for children entering kindergarten in the fall that is strongly encouraged. This experience allows students an opportunity to practice all of the skills they have learned in 4K in our elementary school settings, while having great fun and meeting new friends.